Quietfire Creations: Christmas in July- "Peace" + a Giveaway! 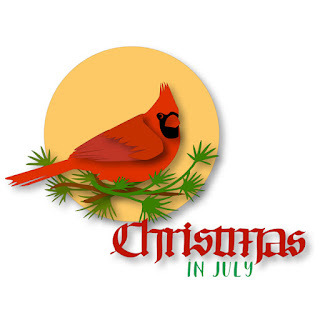 Yesterday Quietfire Design started their Christmas in July celebration: a week full of Christmas inspiration…and a giveaway! Woo-who! 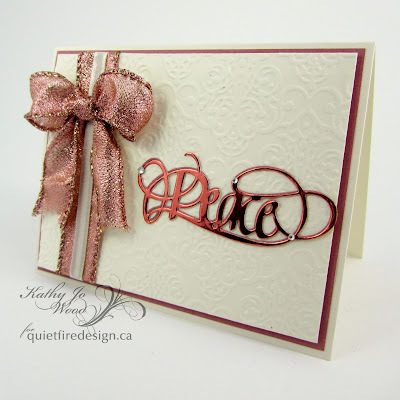 Today is my day to share a project and I used the elegant “Peace” die as the focal point of the card front. You may recognize some of the colors used as I also used the pink metallic paper on recent wedding projects. I had some of the card stock left and thought it would look great for the die cut. The gorgeous metallic die cut really pops on the card front. Create 5.5" x 4.25" top fold card using ivory card stock. Mat pink card stock on card front. 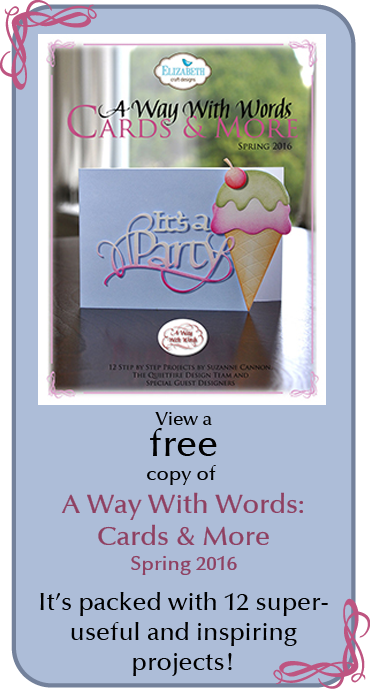 Cut ivory card stock and dry emboss using desired embossing folder. Adhere pink sparkle ribbon and smaller ivory ribbon vertically using double sided adhesive tape. Create and adhere bow using liquid adhesive. 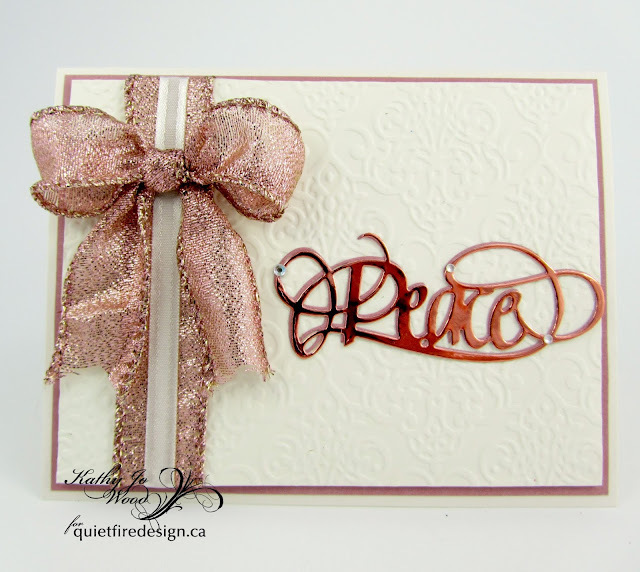 Die cut Peace twice: once with metallic pink card stock and once with pink card stock. Offset mount using liquid adhesive. The lovely Peace die cuts, embossed details and mix of shimmer and shine help to make this an elegant holiday card for a loved one on your list. To celebrate Christmas in July we’re having a giveaway! One randomly chosen follower will win a $25 gift certificate for the Quietfire website. All you have to do to be eligible is comment on the Quietfire Creation blog posts and follow us on YouTube! https://www.youtube.com/user/QuietfireDesign Entries close Sunday July 29, 2018 at midnight. Good luck!! Thanks for stopping by! Have a happy, crafty day! I love the simplicity of this die. No other message needed. Beautiful! So pretty and elegant. Love the ribbon. Very striking card, beautiful in its simplicity. I am really drawn to such cards that use unusual colors for the holidays, rather than the usual red-and-green. You know, the longer I look at this, I realize that with some minor “toning down” (such as deleting the rhinestones and perhaps reducing the size of the bow), this would make a lovely sympathy card, as well. Very different from what is normally seen, but also very effective. That would be lovely as a sympathy card. Good thinking! What an elegant card. Pink is so great for Christmas! Lovely! Your bow is so well done. The die cut is stunning in its simplicity. So elegant and perfect for the holidays. An unusual - but lovely - colour to use for Christmas, love that die-cut! Gorgeous card! We all need a little peace in our lives. My very favorite word! Love this elegant beauty. Gorgeous card. It’s so elegant!